Our product range includes a wide range of fruit processing plants and water demineralization plant. Aguapuro offers complete line for fruit processing and concentration. This plant is for processing of fruits like mango, orange, apple, pears, etc. and for making juice concentration, paste, jam, jelly, ketchup, etc. 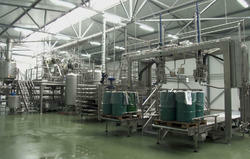 Looking for Friut Processing Plants ?